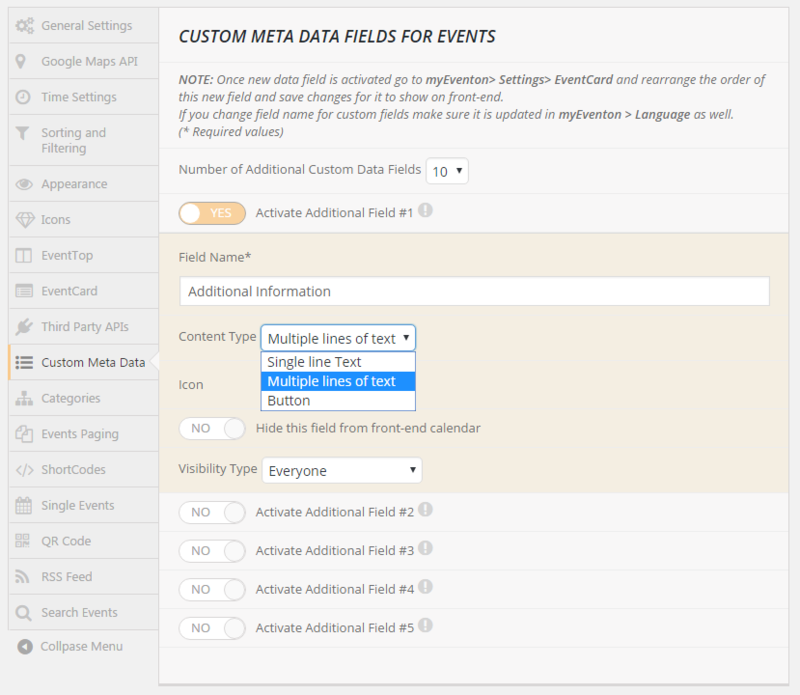 EventON allows you to easily add upto 10 additional custom meta fields to an events so you can use these in all kinds of cool ways to add more data to events and show them on the calendar. Here is how to do it. Type a desired name for this custom field. Select the content type: Single line, multiline & button. Multiline option allow you to type the values for this data field inside a WYSIWYG editor. Button option will allow you to enter a text and link and also whether to open this in new window or not. After you click save changes and page reload click eventCard on settings panel. Under Re-arrange the order of eventcard you will now see the newly added custom field. Click and drag this in the order you want it shown in the eventCard. Go to the event edit page and you will see under Event Settings box towards the bottom you will see the newly added custom meta field along with the icon. Type your data in here and save changes. The new field should show up on the eventCard on front-end. Make sure this custom field appears and is selected.